You interface with a home theater’s A/V receiver through the buttons and knobs on the front (the controls) and through the remote control. The A/V receiver controls a lot of things in your system, such as selection of audio and video sources, volume, surround-sound formats, relative volume levels for surround speakers, and more. Onscreen displays are generally easier to read, but you probably won’t find this feature on most inexpensive receivers. Whether or not you have an onscreen display, it’s important to check out how the receiver’s interface works. For example, most receivers use menu-driven controls (like the menus in a computer program). In some cases, you need to push a lot of buttons and navigate through several menus to get to important controls. That’s okay for things you set once and forget about (such as your initial setup), but such controls are a real pain for procedures you do over and over again (such as selecting a video or audio source). Look for systems that have easy-to-understand menus and direct access to key functions (you have to press only one button to get to them). When evaluating a receiver’s interface, you also want to check out the remote control. 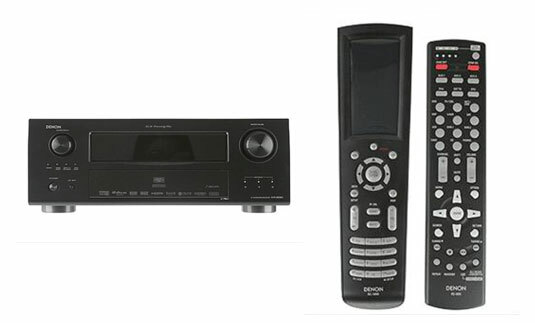 These days, most A/V receivers can control other devices (such as DVD players). Many remotes are learning or programmable ones that can control devices from other manufacturers. Cheaper programmable remotes work only with equipment from the same manufacturer. When you start getting fancy, you find remotes that are backlit (so you can see them in the dark) or even touch-screen remotes (with a touch-sensitive LCD panel instead of a million tiny little buttons).